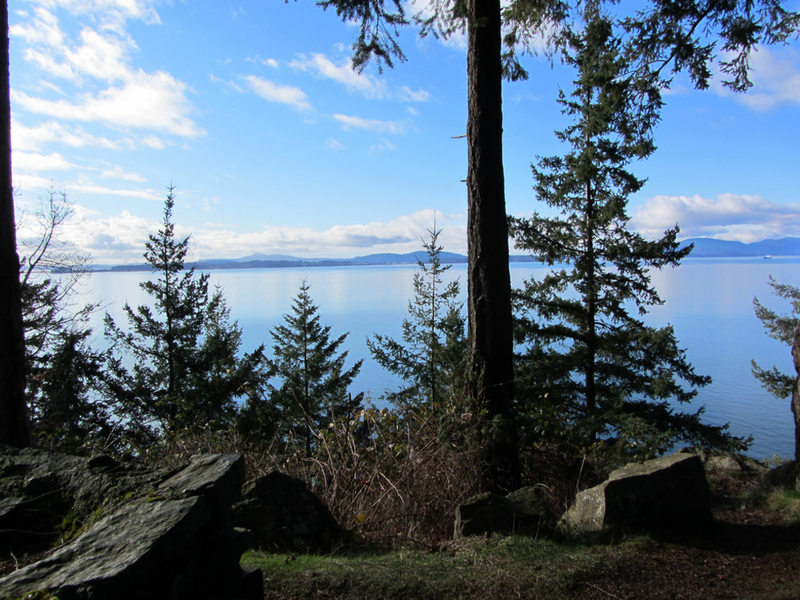 The Chuckanut Ridge Trail is a ridge line trail through the Chuckanut Mountains that offers gorgeous views of the bay and islands to the West and the Chuckanuts (and Mt. Baker on a clear day) to the East. One of the snaking trails that has made the Chuckanuts famous for its views and single-tracks. A real mountain trail, rarely is it wide enough for two people to stand shoulder-to-shoulder. But the soft dirt, roller-coaster ridge line wanders through the forest with views to both sides that make you feel like you're flying. It's a quick run, just roughly 2.5 miles long (one-way), but the up-and-down nature can have your legs coasting at one moment, and then burning the next. Despite the map looking like a straight line, rarely will the trail not be weaving around boulders, over roots, and through trees. Chuckanut Ridge is broken up into 3 sections: Southern, Middle, and Northern. The Southern section is the typical start point. From Bellingham, drive South on Chuckanut Drive (Highway 11) for about 10 minutes and turn left on Cleator Road (also signed Hiline Road). Drive by the houses and then start up the dirt road. It's about 3 miles until the top parking lot (restrooms available), the Cyprus Gates Overlook, which offers a stunning view of the bay. The trailhead is marked by a fence, about 400 yards before the parking lot, on the last turn. The end of the Southern section, 0.4 miles long, is dictated by a small single-track that cuts off down to the West, called "Bailout" - this will dump you onto Cleator Road, where you can run/walk back up to the car. The end of the Middle section. 1.1 miles long, is also dictated by a single-track that will dump you down onto Cleator Road. This trail is longer than "Bailout," is called Lower Ridge Access Trail, and offers great views of the Bay. The Northern Section of the Chuckanut Ridge trail carries on another 0.8 miles, before it meets up with the North Lost Lake Trail. Chuckanut Ridge is doable for all levels of running, but has short bursts of up-and-down, and ultimately has a 200 foot elevation difference from the Northern Section start to the Southern Section end. Mainly accessed from the top of Cleator Road, those looking for a longer run can pick up the Northern side of the ridge trail off of Lost Lake Trail.